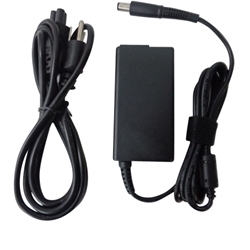 Description: New high quality aftermarket laptop ac adapter charger. This adapter comes with a power cord. *Please check to make sure that your laptop originally came with a 65 watt adapter. Some models may use a 90 watt or 130 watt adapter depending on the specific model. **Also, make sure that your model is listed below as being compatible before purchasing. Tip: 7.4mm x 5.0mm **Please check the tip size on your existing adapter to make sure that you are ordering the correct one. Compatible Part #'s: PA-12, 1X917, 5U092, CF745, TR82J, TJ76K, 331-0536, 310-3149. Alienware M11x, M11x R2, M11x R3. Latitude 13, 131L, 2100, 2110, 2120, D420, D430, D520, D530, D531, D620, D630, D630 XFR, D631, E4200, E4300, E4310, E5400, E5410, E5430, E5500, E5510, E5530, E6220, E6230, E6330, E6400, E6400, E6400 ATG, E6400 XFR, E6410, E6410 ATG, E6420, E6420 ATG, E6420 XFR, E6430, E6430 ATG, E6430s, E6500, E6510, E6520, E6530, XT, XT2, XT2 XFR, Z.